The Mocap Vaults is back with Faceware Technology Inc. and Rouge Mocap to bring you the most exciting event in motion capture this year. On July 28th & 29th the Motion Capture Summit USA returns for a fourth year. This is an event that unites technology and drama for a two day intensive learning experience for actors, directors, animators and technicians, bringing all aspects of the process together for a collective sharing and developing of knowledge and skill. Working in a professional motion capture stage, you'll be taught by a group of industry veterans with specialisation in all areas of mocap. Whether you want to work in front of the cameras or behind them, we're bringing together the greatest minds in the business for a momentus weekend of training and development. Rouge Mocap studio in Marina Del Rey has captured some of the most iconic performances in video games. At last year's Summit, our students put together all they had learned over the two days and shot six scenes under the expert guidance of industry pros. The animation, directing, technical and acting students demonstrated their newfound skills beautifully. With this rare and valuable showreel material the students are able to kickstart their mocap careers and get ahead of the crowd. See the roundup from a previous Summit in the video above. Steven Bender is an Animation Director, Cinematic Director and Writer for video games currently employed by Cloud Imperium Games and working on the Star Citizen franchise. A veteran of Motion Capture and Performance Capture, Steve was responsible for the Animation and Cinematics on the Crysis series (Crysis, Crysis:Warhead, Crysis 2, and Crysis 3) as well as work on Homefront 2 and Ryse: Son of Rome and other titles. Working closely with Game and Level Designers, Steve also designs animation systems and state machines and has been heavily involved in the technical development and design of Engine-side systems that improve the animation process. Steve has also performed in a number of the Crysis titles as well as Star Citizen/Squardon 42, ranging from Cinematic roles to combat and stunt work. He currently lives in Los Angeles, CA and spends time between there, Germany, and the UK. Over the past 15 years, Chuck has worked on projects that include the Jungle Book, Polar Express, Monster House, Batman Arkham Origins and Assasin’s Creed. Acting as motion capture supervisor and animation staff mentor, he is a true specialist in the field of mocap. Formerly the production manager at 2K Games, followed by the new Technicolor mocap stage, he is now the president of Encaptivate LLC, providing virtual production consulting services to the industry. Marc started his career in the entertainment industry in 2011 working as a Mocap artist on Resident Evil 6. His experience on-set facilitated moves to facial capture supervisor, stage manager and mocap supervisor across games like TitanFall, Wolfenstein, Battlefield 4, Shadow of Mordor, Until Dawn, Mad Max and Call of Duty titles. He later moved to films, specializing in Previz using mocap and game engines. He worked mocap previz and VFX on Thor 2, Star Trek Into Darkness, Deadpool, Dawn of the Planet of the Apes, Warcraft, Mazerunner, Ant-Man, X-Men:DOFP and Spiderman Homecoming to name a few. He returned to games and currently works in Los Angeles, developing on-set real-time tools, mocap pipelines and elevating technologies on motion capture stages. With over 16 years of experience in performance capture, Richard has been at the heart of this ever changing technology since it's infancy. With a diverse set of skills in acting, movement, dance, stunts, weapons, Richard has brought to life iconic characters like Darth Vader, Master Chief, Conan, and creatures from games like Left 4 Dead 1 & 2, Silent Hill: Homecoming, Ghostbusters and many more. With a credits list of almost 100 titles that includes Jack the Giant Slayer, Spiderman, Call of Duty series, God of War series, Star Wars: The Force Unleashed II and many more. Richard is now sharing his wisdom and expertise with the new generation of mocap professionals. Co-founder of The Mocap Vaults and performance capture actor with 16 years in the business. Oliver was classically trained at The Bristol Old Vic Theatre School in the UK. His mocap career includes over 100 feature film, video game and television projects, playing characters that include Master Chief, Agent 47, James Bond, Iron Man, Spiderman, the Hulk and Ant Man. While continuing to perform, Oliver now works as a motion capture director and consultant to video game developers, and also works as a lead writer at Saber Interactive Games. Katie Jo Turk holds a Master’s Degree in Dance from the University of California, Irvine and currently lives and works in Los Angeles, CA. She first entered the world of motion capture in 2010 and since then, she’s advanced from Production Assistant to Junior Studio Technician, QC Operator to Lead Studio Technician at UC Irvine, and finally Operations Assistant at Faceware Technologies, Inc. Her passion for mocap has provided numerous opportunities for her and her name can be found in the credits of some major video game titles such as: Uncharted 3: Drake’s Deception, inFamous 2, The Last of Us, and God of War: Ascension. Join us at the Summit as an animator, director or technician and study with some of the industry's finest as you discover motion capture from the production side. Learn how to set up and run a mocap shoot. 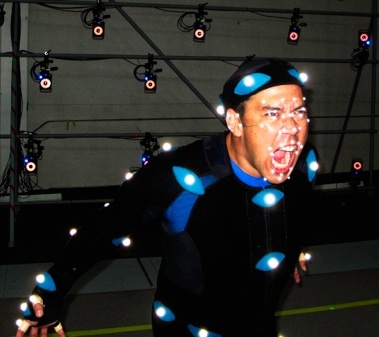 Explore how performance capture data translates to digital characters. Experiment with the virtual camera, a real-time window in the animated world. Masterclasses from Faceware Tech Industries on head mounted cameras and face capture pipelines. Masterclasses from Charlie Ghislandi, discovering the tricks and techniques of the pros. Animators & directors will work with and direct actors to create living characters and scenes. Network with some of the greatest movers and shakers in the business. Two full days in the suit working with mocap tech on a professional stage. Tuition from all the above tutors, all of whom are veterans of the industry and a number of whom regularly employ actors for their projects. A dramatic scene shot in as close to professional conditions as possible, all of which is filmed on multiple cameras in HD. The footage will be provided to you to begin your mocap showreel. Networking with some of the best minds in the business. More fun than money can buy! Join us at the Summit as an observer and discover the inner working of a professional motion capture stage. Take part in our action packed shoot and get to grips with every aspect of the production. To apply for one of the above places at the Summit, please fill out the below form and we will respond to you once we have had a chance to assess all applications. If applying for an ACTOR place then you MUST have trained with us already.